Medical Insurance billing is complex and the process is often counter-intuitive to patients. The primary reason for much of the confusion is that balances are often not generated until weeks or even months after the office visit or procedure. We are going to review some of the steps in insurance billing that are true for most medical offices. We will also review some Specialty Natural Medicine specific processes. We will not be reviewing lab billing for insurance as that is handled by each individual lab. Medical Billing Insurance specific terms will be italicized, with definitions for each term at the end of this post. You visit your Doctor for preventive treatment or with a chief complaint, or symptom or diagnosis you wish to be treated. This triggers an outgoing claim to your insurance company. Your Doctor's office will generate a health insurance claim with appropriate billing codes and submit the claim to your insurance company, or companies if you have secondary insurance. In most cases, health insurance claims are now submitted electronically to your insurance company. The Explanation of Benefits, or EOB, is detailed information returned from your insurance company detailing coverage for a date of service. This is where details such as adjustments, deductibles, co-pay and co-insurance are detailed. The Patient Balance Statement is generated based on details from the Explanation of Benefits. 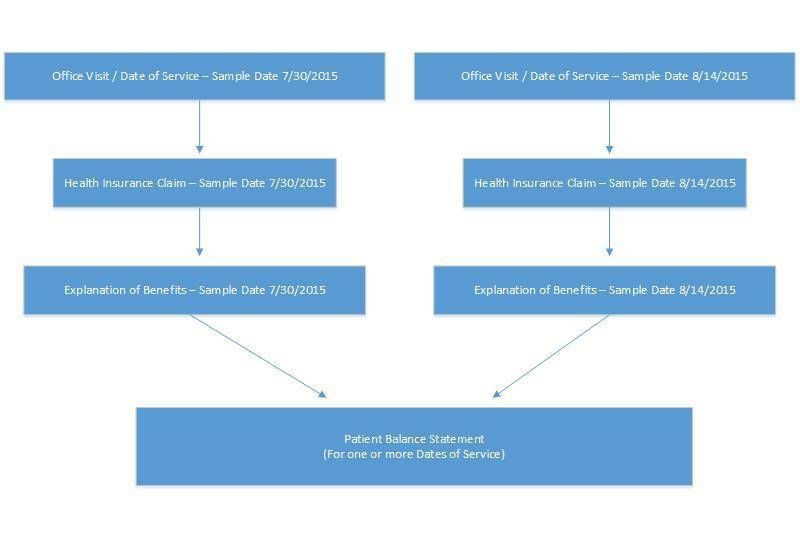 The Patient Balance Statement is unique in this process in that it may reflect multiple dates of service while every other step in the process is tied to a single date of service. This step also included patient payment processing and posting. We will go into more detail below, but the important thing to remember is that each Date of Service has the potential to produce a Patient Balance Statement. That is dependent on whether a patient has deductible remaining or pays a co-insurance for the Date of Service. Each Patient Balance Statement may include one or more dates of service. More details in the Patient Balance Statement FAQ near the end of this post. The trigger for billing medical insurance is the office visit. When you visit your Doctor, an office visit is billed to your insurance company along with any specific procedures that were performed at that date of service. All office visits and procedures are billed using Current Procedural Terminology (CPT). These CPT codes, along with diagnostic codes (ICD-9, ICD-10), are used by your insurance company to determine what they will pay and how much they will pay on your behalf. Items (supplements) or procedures (IV Therapy) that are not billed to insurance are paid for at check-out. This occurs more frequently at Naturopathic Doctors offices since supplements and most nutrition based medicine are not covered by insurance companies. Naturopathic Offices will also often use labs that are not covered by insurance billing. Payments for non-insurance lab services are paid directly to the lab, with patient payment information (check or credit card information) submitted to the insurance company on your date of service. Any known co-pays are also collected on your date of service. This step can be confusing to patients as they will pay for supplements, etc and receive an invoice stamped "paid" at the end of check-out. Although the line items on the invoice may be paid, a balance from the date of service may still be generated depending on the Explanation of Benefits returned by the insurance company. Once your visit is complete, balances are generated. If you paid a co-pay, a credit exists in your account for that date of service. A balance against your insurance company is also generated for the office visit and/or procedures. Let's take the scenario where you visit your Doctor for a return office visit. Let's also say that you receive a trigger point injection for pain management at the visit. The Doctor would use CPT codes for the visit along with diagnostic codes. (ICD-9 codes or ICD-10 after October 1, 2015). Note: Diagnostic codes are important to the billing process, but are rarely seen in patient viewable paperwork. The CPT code 99214 is a code for a return office visit. The CPT code 96372 is for a trigger point injection procedure. Each billing code is it's own row in the example above. Note that each row has a column for Ins Bal and Pt Bal. These stand for Insurance Balance and Patient Balance. In this example, the current insurance balance is $160.00 and the patient balance is -$30.00. The Patient Balance is a negative balance for this date of service as the co-pay has been collected and posted. More on that in the Explanation of Benefits section. Separate from the health insurance claim and the patient balance statement is the patient invoice. The invoice shows items purchased and paid for at check-out, including supplements and non-covered cash services such as nutritional IVs. 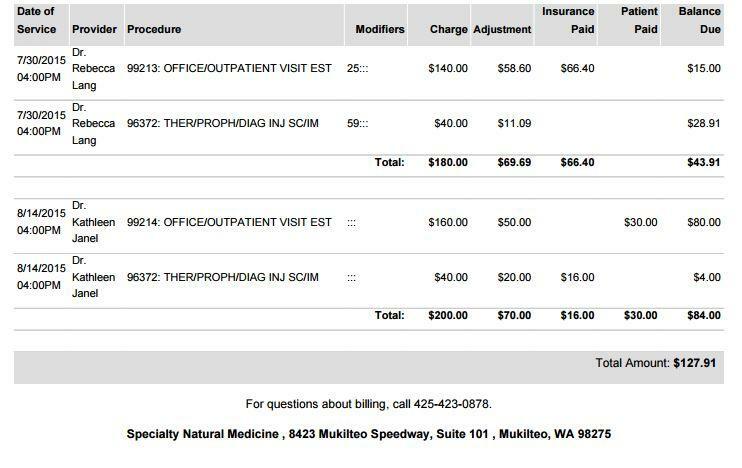 At Specialty Natural Medicine, we will list the Office Visit and the Procedure on the invoice you receive at check-out. If you paid a co-pay, then you will see that amount on the office visit line. The procedure will generally list cost of zero on the invoice. We list those items on the invoice as a convenience to the patient. They may end up generating a balance dependent on an individual's insurance plan, pending insurance processing. After the claim is submitted and processed, the submitting office and the patient will each receive an Explanation of Benefits (EOB). Electronic EOBs are commonly referred to as ERA (Electronic Remittance Advice), but we will use the term EOB in this post to describe both paper and electronic explanation of benefits. EOBs are returned by the insurance company with varying delays. Denials and Not Eligible are generally returned quicker than paid claims. The delay in returns can vary between a week to several months depending on the payor (Payor is another term for insurance company). Not Eligible returns come back either because the insurance information entered was incorrect, or because the insurance coverage was terminated. This generally results in an employee or representative from Specialty Natural Medicine reaching out to the patient or responsible party to gather the correct insurance information. Not Eligible returns can be be resubmitted if it is determined that the claim was returned in error. Denied claims are different than Not Eligible, in that it signifies the patient has coverage but the particular procedure or provider is not covered under the patient's plan. When it is the office visit that is denied, it is almost always due to the patient's plan not covering Naturopathic Doctors. We always recommend patient's contact their insurance company to confirm ND coverage before their first office visit. We have had patients who successfully appealed a denial and get their visits covered, but only when they first called their insurance company to confirm ND coverage. We always have our billers contact the insurance company to follow-up on denied claims. In some cases we are able to resolve without the patient ever being involved. In cases where we cannot resolve on our own, we will contact the patient to assist in next steps. In cases where a denied claim cannot be reversed, we will work with patients on cash rates so they can continue working with their Doctor at Specialty Natural Medicine. In rare cases, the office visit will be covered but a specific procedure will be denied. This is very rare as the clinic has a good understanding of what procedures will be covered and generally collect for non-covered services at the time of service. Paid in Full (with our without Co-pay) occurs when the insurance pays for the covered service on the patient's behalf. In these cases, the EOB will include adjustments to reflect the contracted price agreement between the Doctor and the insurance company. It will also show the patient liability amount as a co-pay. In most cases, the co-pay will have been collected at the date of service. This will result in an insurance balance of zero and a patient balance of zero. In these cases, this is the end of the cycle and no patient balance statement will be generated for the date of service. Covered, with co-insurance or deductible balance occurs when the claim is accepted, but the insurance company pays partially or not at all for the covered services. In these cases, the EOB will again include adjustments to to reflect the contracted price agreement between the Doctor and the insurance company. It will also show any payments made by the insurance company on behalf of the patient. The remaining balance is shifted from the insurance company to the patient. This will result in a patient balance statement being generated. The first thing to note here is that the Insurance Balance and the Patient Balance are each zero. This means that no Patient Balance Statement will be generated. The next thing to notice are the transactions listed under each CPT row. The first line under the 99214 CPT code shows the contractual adjustment of $50.00 and the insurance payment of $80.00. The contractual adjustment is the "discount" from the Doctors billed rate down to the amount that the Doctor has agreed to receive for that particular service. All in-network provides agree to these discounted rates as part of being in a particular service network. Note the second transaction line under 99214. It shows a co-payment amount of $30.00. This transaction transfers $30 of the overall billed balance to the patient. Since that $30 co-pay was collected at the date of service, the net impact is a zero patient balance. The procedure code 96372 has been adjusted $20.00, with the remaining $20 paid by insurance. This is an example of an insurance claim where the office visit is processed as going against the deductible and the procedure generates a co-insurance balance. Taking a closer look at the first transaction under the 99214 row shows the insurance adjustment of $50, making the remaining balance $110. The second transaction under the 99214 CPT code flags the remaining $110 balance as a deductible. This transaction line transfers that $110 balance to the patient as deductible. Next is the 96372 CPT code. The first transaction under 96372 shows a $20 contractual adjustment and a $16.00 insurance payment. That $16 payment is 80% of the adjusted balance of $20. It is not atypical for co-insurance to be based on a percentage of the contracted rates. The second transaction line show that the remaining $4 balance is a co-insurance amount. This transaction transfers the $4 balance to the patient as co-insurance. This particular sample would leave the patient with an $84 balance. Specialty Natural Medicine would send a patient balance statement for this balance and/or collect at next date of service. Patient Balance Statements get generated based on explanation of benefits from your insurance company. They reflect the adjustments made by your insurance company, and in some circumstances adjustments made by Specialty Natural Medicine. Note that the Patient Balance Statement is unique in this process as it can cover multiple dates of service. Above is an example of the Patient Balance Statement based on the "Covered, with co-insurance and deductible balance Sample" EOB in the previous section. You can see the charges we billed in the insurance claim, the adjustments made by the insurance company, the amount paid by insurance and the remaining patient balance. Above is a Patient Balance Statement for multiple dates of service. Each has multiple billed CPT codes for each date of service along with the adjustments applied by insurance payors and Specialty Natural Medicine. It also shows a collected co-pay of $30 for the August 14, 2105 date of service. When a particular date of service has been paid for, it will no longer be listed on the Patient Balance Statement. As noted, each step in this process has it's own cycle for a particular date of service except for the Patient Balance Statement. Specialty Natural Medicine also is dependent on receiving on Explanation of Benefits from insurance companies This can sometimes cause confusion for patients. The important thing to keep in mind is that with very rare exceptions, Patient Balance Statements are generated based on EOBs from your insurance company. Before we get to to the FAQ, I want to stress that patients are always welcome and encouraged to call or email us regarding their balances. We would prefer to hear about any potential concerns or issues as soon as possible so we can resolve or come up with a plan. We work hard to catch billing mistakes before Patient Balance Statements go out, but sometimes we may miss something. Why am I getting a bill for an appointment "x" weeks ago? This question usually comes up because a patient has paid for non-covered items at check-out, like supplements, IV Therapy or even 3rd party labs. The office visit and/or procedure had not been paid for at check-out and was billed to insurance. As noted in the details above, it can take some time for us to receive an explanation of benefits when we bill your office visit and procedures. What is important to remember is that if we are billing insurance on your behalf, there may be future patient liability based on the results of the explanation of benefits. We will send out a detailed patient balance statement based on the results of the EOB, and are always happy to explain the details of the statement. I paid my balance last time I was in. Why am I receiving a Patient Balance Statement for the same amount? There are two basic scenarios where this can happen. One is very simple: A patient pays their bill in office while the paper statements are in the mail or in process by our biller. In these cases the patient can disregard the paper statement, or call or email us to check on their balance. The other common scenario is that a balance for one date of service has been paid, and the new statement is for a different date of service. Imagine you come in to see your Doctor for an office visit once a month for 3 months in a row. For this example, let's say you had appointments on July 1st, August 1st and September 1st. After the visit on July 1st, we bill insurance on your behalf. Before your August 1st appointment, we receive an EOB showing a patient liability of $19. You pay the $19 balance and return on September 1st and again have a balance for $19. That is because we have received your EOB for the August 1st appointment that generated a NEW balance. I received a call from someone about my bill? I have only received one statement (or none at all)! Specialty Natural Medicine has recently started having our billers start doing courtesy calls on patient balances. We have implemented this as we have received feedback from patients that paper statements do not always catch their attention. We have always had our best success when patients are aware of new or building balances and we can work together to arrange cash rates or payment plans on balances. An appeal is the action you can take if you disagree with a coverage or payment decision made by your insurance company. Specialty Natural Medicine has observed that appeals have the highest rate of success when patients confirm coverage with their insurance company via phone prior to their first appointment. The primary reason or symptom that a patient states for seeking medical care. Note that the existent of a chief complaint generally indicates an office visit versus preventive care visit. Adjustments to insurance or patient balances made by Specialty Natural Medicine. These generally occur on claim denials to limit the patient liability for the appointment. The price that Specialty Natural Medicine has agreed to accept for covered office visits and procedures. These amounts can be paid in full by the insurance company, be paid in full by the patient (most often as a deductible) or be a shared cost of the insurance payor and patient (co-insurance or co-pay). The adjustment made to amounts billed by Specialty Natural Medicine to insurance payors. These adjustments are based on the contracted price agreement with the insurance payor. The amount that patients are responsible for after any price adjustments made by insurance payors. A typical scenario is an 80/20 split, where the insurance company pays 80% of the contracted price and patients are responsible to pay the clinic the remaining 20%. The actual dollar amount due depends on the adjusted costs of the visit and procedures. A set amount that the patient is responsible for on a covered office visit. Some insurance plans waive deductibles for office visits, while others do not (see this blog for more information on plans that waive deductibles for office visits). A billed visit or procedure that is covered by your insurance company. Please note that covered services may be paid by insurance payors, while other result in patient liability via deductible, co-insurance or co-pay. The billing codes used for office visits or procedures. Specialty Natural Medicine can provide the CPT codes we commonly use for office visits so patients can call their insurance company and determine coverage and patient liability prior to their appointment. The date that the patient came in for the visit or procedure. The date of service (DOS) is one of the primary items needed when investigating results of health insurance claims. Most insurance plans have a deductible. This is the amount that the patient needs to pay per year before the insurance company will start making payments on their behalf. It is important to note that even covered services may result in patient balance and liability based on a plans deductible. Some insurance companies and plans cover office visits with a waived deductible. A claim denial is the refusal of an insurance company or payor to honor a request by an individual (or the clinic) to pay for health care services obtained from their Doctor. Denials received by Specialty Natural Medicine result in our biller contacting the insurance payor to attempt to resolve. We will also work with patients to try and resolve denied claims. Codes submitted by your Doctor explaining the conditions being treated. In insurance billing, diagnostic codes are associated with specific CPT codes. Reports from the insurance company that explain benefits, coverage, adjustments and patient liability via co-pay, co-insurance, deductible and denials. EOBs are generally sent to both the clinic and to patients. The claim sent to insurance payors by Specialty Natural Medicine on behalf of the patient. Claims include details such as patient demographics, date of service, CPT and diagnostic codes. The balance pending against the insurance payor on an insurance claim. Generally, insurance balances reach zero after the explanation of benefits is received. Services, goods and labs that are not covered by insurance. Insurance payors consider many of the tests, procedures and supplements used by Naturopathic Doctors as investigational and will not pay for any of these. In some cases, there is not even an associated CPT billing code for which to submit a claim. A denial that does not include an explanation of benefits. Most often, not eligible comes back when insurance coverage has expired or when insurance information submitted in inaccurate or incomplete. Generally, patients are not notified when Specialty Natural Medicine received a not eligible response to a health insurance claim. A patient visit to their Doctor or health care provider. Office visits may be subject to co-pay, co-insurance or deductible. Explanation of Benefits where insurance pays for all liability leaving patients with a zero balance. In some cases, the patient balance that would have been generated was collected as a co-pay at time of service. Any patient liability after claim processing and receipt of explanation of benefits. This balance can occur even on covered claims via co-pay, co-insurance or deductible. Denied claims that are not successfully appealed will also generate patient balances. Your insurance company. Called a payor as they pay benefits on your behalf. Health care visits to prevent illness or detect illness at an early stage. Preventive services include Pap tests and annual physicals. The presence of a chief complaint generally is not a preventive visit and needs to be billed as an office visit.